Morkie puppies are a wonderful breed. The specialty designer pup is a non- shedding and hypo-allergenic and makes a wonderful inside pet. The Morkie is a lively, spirited, intelligent and loving dog. The mix of Maltese and Yorkshire Terrier usually produces a lively, playful dog devoted to its family with a loving sweet nature. The Morkie loves to play or curl up on the couch for a nap and requires frequent human companionship. Yorkie is the playful side. Maltese is the lap dog part. And of course they are both known for the silky soft hair that is closest to human hair and like ours, requires daily brushing. They are well-proportioned, sturdy, and hardy in appearance. They possess a lively and sweet expression. They are affectionate, loyal, devoted. A wonderful addition to any family who has love to give. Temperament: The Morkie will do well with other dogs and non-canine pets that they have been raised with. If left alone too long, a Morkie may become bored and destructive along with incessant barking. They long for human companionship. The Morkie is suspicious of strangers and will alert the family to a stranger’s presence as well as any sounds that appear out of the ordinary. Care: The Morkie requires daily brushing to keep the hair from matting and tangling. Bathe when necessary and be sure to use a mild shampoo to avoid skin reactions. Training: The Morkie should be socialized at an early age. Morkies can be a bit stubborn and require a gentle but firm and patient trainer. Special emphasis should be put on potty-training as some Morkies can be difficult to housebreak. Activity: A Morkie is well suited for apartment living as long as they are sufficiently exercised and have toys to play with. They enjoy family play time, walks and play time in a fenced yard. Morkipoo are precious puppies to own. The three most desired breeds in one: Yorkie, Maltese and Poodle. Not many people breed them… usually only Morkie or Yorkipoo. But I have people who request Morkipoo because when you add the Poodle in the breed, their intelligence level can be unbelievable. 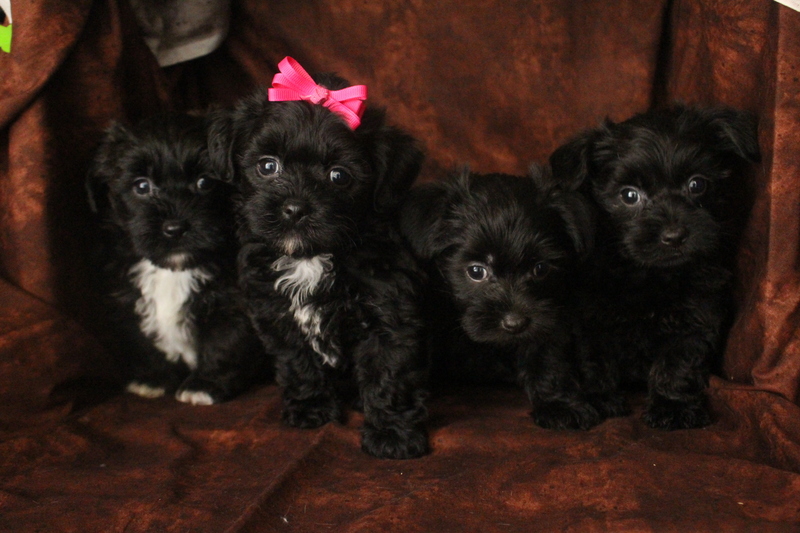 They are either bred as a Morkie and Yorkipoo, or Maltipoo and Yorkipoo. They are small average weight between 5-11 pounds. They are hypo-allergenic and non-shedding, making them a wonderful inside family member and perfect for apartment and condo life. Poodle is rated the second smartest dog in animal kingdom, where as the Yorkie is a fun. Yorkshire Terriers become attached to their families, but most maintain some measure of independence. Maltese is one of the brightest and gentlest of the toy breeds and can be exceedingly playful enjoying clever games of dexterity such as “pull the hidden toy from under the cabinet with your paw.” Morkipoos will be intelligent as well as spirited, lively and playful. Gentle, loving, trusting and devoted to it’s master. Size: The Morkipoo comes in a wide variety of sizes, but most weigh 5-15 lbs. A Morkipoo with more Maltese or Yorkie influence will have a domed skull, whereas a Morkipoo with a higher Poodle influence will have the long, narrow muzzle characteristic of Poodles. Coat: The Morkipoo coat can range from the silky texture of the Yorkie or Maltese coat to the Poodle’s distinctive frizzy coat. It can be many colors including take after Poodle, Maltese or Yorkie so it’s always a surprise package when they are born. Character: The Morkipoo is an intelligent, loving dog. The mix of Maltese, Yorkie and Poodle usually produces a lively, playful dog devoted to its family. The Morkipoo loves to play or curl up on the couch for a nap, making them a snuggle cuddly pup. Morkipoo require frequent human companionship. Temperament: The Morkipoo can get along well with dogs and other pets if socialized when young, but it is somewhat territorial. Morkipoo may be wary of strangers and are highly protective of their family. Morkipoo get along very well with children. Care: The Morkipoo sheds little or no hair. It requires monthly grooming and regular brushing to prevent tangling. The eyes and ears should also be cleaned regularly with stray hairs removed. Bathe only when necessary. Puppies should not be handled constantly as they need time to rest and relax. Training: The Morkipoo is eager to learn and should not present many difficulties in training. Positive reinforcement is likely to be the most successful approach. This breed may take a while to house train. Like the Maltese, many Morkipoo are paper or box trained rather than ‘outdoor’ trained. I am searching for a female Morkiepoo that will be 5lbs or under when fully grown. Can you help? How much does a female morkiepoo cost? I’m looking for a morkie poo. have two adorable Morkipoo that will be ready first of Sept one male (Biscuite) He a cream curly boy and one female (Honey) She is a smooth silky coat brindle cream beauty. I would love to have pictures, prices, etc. I am very interested!!! Please send pictures/prices of available pups. I am in Jacksonville FL But I have two adorable Morkipoo that will be ready first of Sept one male (Biscuite) He a cream curly boy and one female (Honey) She is a smooth silky coat brindle cream beauty. Hello: Still looking for a black morkie please let me know if you have any? We do not have any Morkies at this time. Do you have any Morkie or Morkipoo available? What is the cost? We are expecting our next Morkipoo litter on 10/28. They are $1750 unless they are a red or chocolate in color then they are $2000. Hello I’m looking for a female light colored one like the creamy tan, black & white. Hi just wondering if you did get a litter of puppies? We just had a litter of 2 Morkipoo’s but we are waiting to hear back from our clients with deposits on if they want them or not! We are expecting Morkipoo’s any day now! Our momma is showing early signs of labor. We are expecting our next litter in a few weeks! They are $1750 unless they are a red,chocolate or teacup then they are $2000. I would like to know if you have any Morkies available and if not do you expect any in Feb or March? 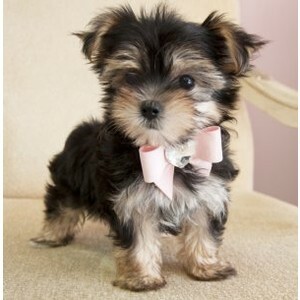 Can you also tell me the price for a Morkie? And where are you located ? Hello, I am looking for a morkie poo male puppy, preferably black or black and white. We are retired, and have a lot of love for a precious new fur baby! Thank-you! Are the morkies still available?